Trainer John Gosden will decide whether favourite Too Darn Hot can run in the Qipco 2,000 Guineas after this weekend. The unbeaten colt, owned by composer Lord Lloyd-Webber, missed the Greenham Stakes at Newbury last Saturday with a leg issue and his Classic run is in the balance. Gosden said: ‘There was heat in the splint bone which is why we couldn’t run. It was only six days ago but has improved a great deal. Over the weekend one’s got to be making decisions. It is not one of these things where you um and ah up to the race. Dewhurst Stakes winner Too Darn Hot is 6-4 for the 2,000 Guineas at Newmarket on May 5. A clutch of Guineas possibles, headed by Saeed Bin Suroor’s Royal Marine, line up in the Craven Stakes at Newmarket on Wednesday. Andrew Balding-trained Shine So Bright earned his place in the 2,000 Guineas place with victory in yesterday’s European Free Handicap. 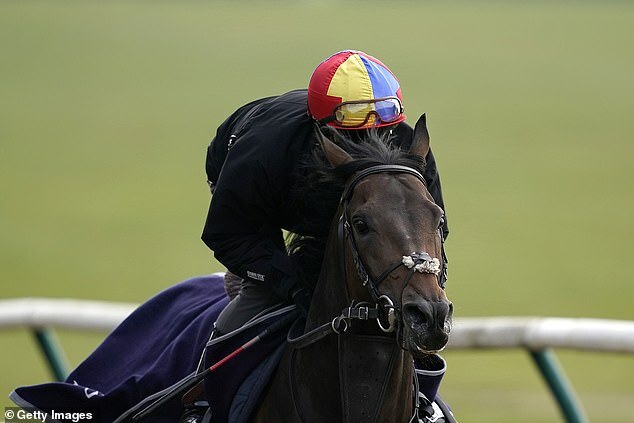 Gosden’s Kick On, winner of the Feilden Stakes, is likely to be aimed at the French 2,000 Guineas at Longchamp on May 12.